This book describes the background in which Ghalib lived and worked. 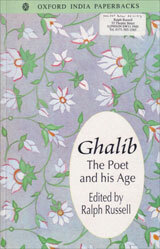 It is a collection of five articles - two of them by Ralph Russell - which, taken together, give a full picture of the age in which Ghalib lived, along with a survey of his Persian and Urdu verse. Nearly all are included in the Oxford India Ghalib.